Attention Deficit Hyperactivity Disorder (ADHD) represents one of the most common mental health conditions and remains one of the most frequent clinical presentations at Child and Adolescent Mental Health Services in Ireland. Recognising this and the need for shared research on the disorder the Irish Journal of Psychological Medicine* (IJPM) is delighted to launch a dedicated edition to ADHD, Special Issue: Attention Deficit Hyperactivity Disorder (Volume 35 Issue 3), compiled by guest editors and Consultant child & adolescent psychiatrists, Dr Blánaid Gavin and Prof Fiona McNicholas. This issue reinforces the importance of early intervention in order to optimise positive outcomes for people with ADHD, to reduce their experiences of distress, and to give them the best chance to reach their full potential in life. While ADHD is commonly recognised as a childhood disorder, continuation of mental health difficulties into adulthood is important to consider when planning services for those with ADHD. 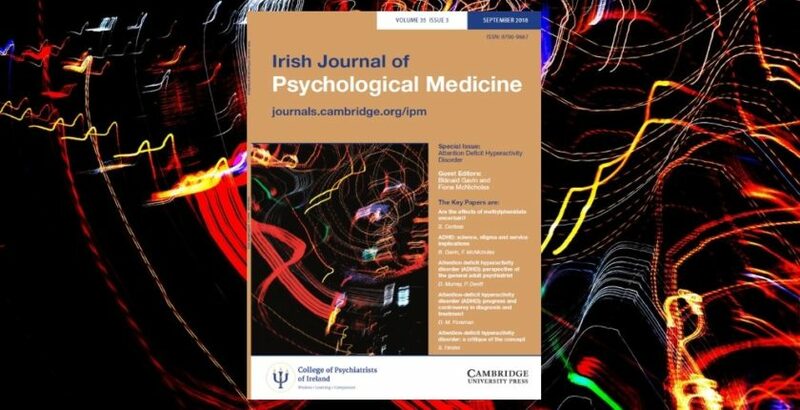 The IJPM is the official research journal of the College of Psychiatrists of Ireland and this special issue endeavours to offer varied insights into ADHD, current discussions about the disorder, and provides information for clinicians seeking guidance on day-to-day clinical practice. Some articles from this edition are Open Access. To read all articles from this issue, please click here.